Ultrafast Broadband Guide | What is it? Can you get it in your area? What is ultrafast broadband good for? Do I need ultrafast broadband? Which providers offer 300Mb+ internet? I'm running a business, do I need ultrafast broadband? Can I get ultrafast broadband, and where can I buy it? When will my area get ultrafast? If standard or even superfast broadband isn't quick enough for you, it might be time to consider upgrading to a cutting edge ultrafast fibre broadband service. But what exactly is ultrafast broadband, how fast does it go, and is it really something you need? In this guide we'll answer all your ultrafast questions and show you how to find a great value ultrafast broadband deal. Ultrafast broadband is a very high speed broadband connection. This term does not refer to a specific type of broadband technology but can be applied to any connection that is fast enough to qualify. Commercially available ultrafast broadband services use fixed lines - either Fibre To the Premises (FTTP) or Hybrid Fibre Coaxial (HFC) in the case of Virgin Media. What are FTTP & HFC? FTTP (or FTTH - Fibre To The Home) is a connection that uses fibre optic cables all the way into homes and businesses. This is much faster than most of the fixed line broadband services we currently have in the UK, which still make use of the outdated copper telephone network. HFC is the technology used by Virgin Media. Fibre optic lines carry the signal to street cabinets, then it continues into homes with a coaxial cable. This is faster than the copper telephone network but not as fast as a full fibre service. 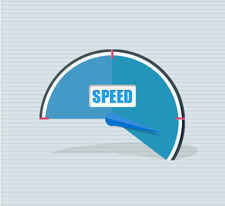 As with superfast broadband there is no official universally recognised definition of ultrafast broadband, however Ofcom defines it as any connection with a download speed of 300Mbps+. Upload speed is not usually part of the definition, but you can also expect a very high upload speed, with some ultrafast fibre services offering a symmetrical connection where the download and upload rate are the same (as opposed to asymmetrical where it’s faster in one direction, usually in favour of download speed). If you're not sure what broadband speeds actually mean or what kind of broadband speed you might need, our guide to internet speed has more information. Ultrafast broadband is capable of doing anything a regular broadband service can do, only much quicker! Ultrafast broadband makes large downloads trivial. The upload speed is also much better,which is very helpful if you need to frequently send big files. If your connection often slows down when your entire home is online at the same time, ultrafast broadband can provide enough bandwidth that everyone can do what they like with the internet without affecting anyone else. Ultrafast broadband is easily quick enough to handle very high definition 4K video streaming, even if several people are all streaming video at once. Ultrafast broadband can let you download large games much faster, and the extra upload speed is useful for hosting online games and broadcasting video. Few of us could truly claim we need ultrafast, but if you do any of the above on a regular basis you’ll appreciate the extra speed. More than anything else it’s going to be a big quality of life upgrade for homes where the connection is shared between many users and devices. If you're still not sure, check out our guide to what internet speed you need. The Virgin Media VIVID 350 package offers average download speeds of 362Mb. This is the most widely available ultrafast service, and if you’re within the Virgin Media network area (covering just over 60% of homes) there’s a good chance you can get this service. BT recently launched the Infinity 4 service with speeds up to 314Mb. This uses either FTTP or G.fast technology, depending on availability. However there are less than 1m properties covered by these services at this time, though this is planned to expand to 12m by 2020. Hyperoptic operates its own pure fibre (FTTP) broadband network and can deliver speeds up to 1Gb. It mainly operates in central London, and has been focusing on installing services to new build flats. The good and somewhat surprising news is that ultrafast is not too expensive! Virgin Media ultrafast services start at around £50, while BT Infinity Ultrafast is around £60 per month. Even the very high speed gigabit FTTP connections are relatively affordable, with Hyperoptic charging around £60. While this is probably more than you pay now it’s likely that once ultrafast is more widely available we will see cheaper deals as providers compete for customers. Of course, if price is the most important factor then ultrafast is not the right choice for you. There are plenty of cheap broadband deals which also offer very good speeds to suit most people. Some businesses would definitely benefit from ultrafast. If you have more than a handful of employees you could find that regular broadband services get very slow when everyone is online at once. Ultrafast (or indeed leased line broadband) could solve this for many SMEs. Businesses are also more likely to frequently send or receive very large amounts of data. In some cases even a small business could benefit from an upgrade to ultrafast. Businesses can sign up for the same ultrafast services as home users. In most cases the providers will have a business offering that delivers the same speeds, plus additional features such as specialist business support. If you’d like to learn more our guide to business broadband can help. It is possible you could get ultrafast right now, though at present ultrafast broadband is not available to as many homes or businesses as the ADSL or fibre optic broadband (using FTTC technology) that covers most premises in the UK. Ultrafast broadband deals are available to buy from Broadband Genie. Entering a postcode into our broadband comparison tables will sort by location, and will include ultrafast deals when they are available. You can also use the table filters to search for a minimum broadband speed. The rollout of ultrafast broadband is gathering pace so coverage is improving all the time, but it’s hard to say when you may be able to get it. If you’re in a larger town or city there’s a good chance it will be available within a few years, however more remote locations could be waiting a lot longer. Keep an eye on news for broadband in your area to get a heads-up of new developments.